Have you ever eaten “Nikujyaga” ?? 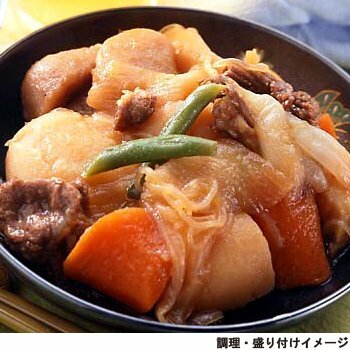 It’s a very popular Japanese dish, meaning potatoes and meet stewed with sugar and soy sauce. I’ll make you some Nikujyaga today! 1, Put the oil into the pan. 2,Stir fly Potatoes and Carrot first. 3,After 1~2 minutes put Onions in. Stir-fly until the onions turned clear. It is very useful Dashi! I use 1/2packed(3g) it today. 5,Put Sugar and Mirin, after 10minutes stewed add Soy sauce. 6,Cook slowly 15-20 minutes, add Beef and cook more 5-10 minutes. Sure,We can put into bento!! Once you come in Tokyo, you would be able to enjoy other regions of Japan by local products exhibition.